Cornices develop whenever snow is available for transport and the wind is sufficiently strong to move the snow. The ideal wind speed for cornice development is 15 to 25 mph. Stronger wind speeds tend to move snow further down slope, which creates other hazards (see Wind Slab, Persistent Slab). Cornices can form quickly with favorable wind speeds and abundant available snow, typically following a recent storm. 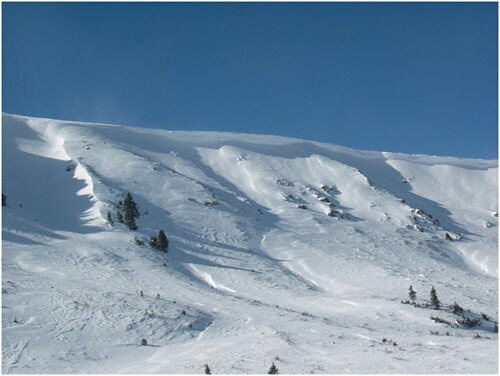 Multiple wind events over time generate large overhanging cornices comprised of numerous hard snow layers often interspersed with soft weak snow layers or hollow tunnels. Cornices form on the downwind (leeward) side of sharp terrain features. Ridges above treeline are the most common locations. Cornices also form downwind of vertical ridge lines and tops of couloirs, in a process referred to as cross-loading. The largest Cornices form over time in areas that receive persistent wind from a similar wind direction. A common example is an above treeline saddle that funnels persistent winds, resulting in a Cornice that increases in size through the winter season. In Colorado, high elevation winds typically blow from southwest through northwest; and hence, large Cornices are more likely to form on the easterly side of terrain features. A corniced ridgeline. A large cornice has formed at the top of the ridge. A smaller cornice has formed to the left of the trees from crossloading. Cornices develop in periods ranging anywhere from hours to all season. A brief wind event following storm snow quickly generates soft cornices on the lee of any terrain feature. Soft wind cornices are easy to trigger artificially. If they are not large, then they are often manageable by themselves. Soft Cornice Fall, however, can run long and fast while quickly entraining additional snow that results in a much larger and dangerous avalanche. A longer wind event, typically lasting at least a day, generates larger and harder Cornices. These stiff Cornices may appear supportive of a human, but they cannot be trusted. Additional weight, from more snow load or a human, can result in a crack that easily propagates resulting in a Cornice Fall. This can happen from a distance resulting in a remote release. Cornices can build to very large sizes through the winter. These large Cornice Falls are difficult to trigger, but if they do, the consequences can be deadly. Fortunately, Cornices are easy to see. Weather and terrain awareness are the best tools for recognizing potential cornice problems. When planning a backcountry trip, use topographic maps to learn where potentially hazardous cornices can form. Pay attention to weather observations during the past several days and wind forecasts to understand where Cornices are forming. While in the backcountry, look for cornice formation on the lee of terrain features. Look for local terrain-driven wind effects, which may generate Cornices in unexpected locations. Pay attention to unusual weather events. For example, winds from the east (often associated with a Front Range upslope storm) generate Cornices on westerly aspects. Cornices can never be trusted; and hence, avoiding them is necessary for safe backcountry travel. While moving along ridge lines stay well back from areas with cornice formation. Cornices often overhang the ridge edge and added weight can release the cornice, often from a remote distance. If necessary, use a probe pole to determine the existence of hard ground underneath the snow. Avoid areas underneath Cornices. Even small Cornice Fall can trigger a larger avalanche that runs far downhill. Large Cornice Fall can easily crush and kill a human. The spring season, or any period of significant temperature warm-up, are times to be particularly aware. Large Cornice Falls are most common during these weather regimes.